Featuring: Jeremy Theobald, Alex Haw, Lucy Russell. Director: Christopher Nolan. Christopher Nolan is an interesting director and the nice thing about interesting directors is that they can tell a good story with a minimal budget. The other thing about interesting directors that got started in the 90's is that they can't seem to tell stories in sequential order. I've always wondered why that is. Is it the Tarantino effect or do they teach you in film school that telling a narrative from beginning to end is just too mainstream? Luckily, Mr. Nolan was, and is, a talented enough storyteller to avoid having this movie become one of those cliches and now his movies have made billions of dollars. Following is the story of a guy who well, follows people. Yes, this movie embraces the creepers of the world. What keeps this movie from becoming a voyeuristic bore is that the people he follows turn out to be even stranger than he is. Considering the low budget, this film has just enough twists and turns to be a pretty good movie. Don't expect incredible acting or many pretty shots. But the story moves well and is unique enough to carry the film. 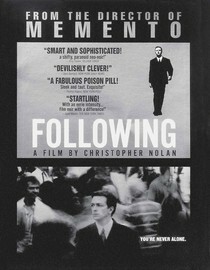 If you're a fan of Nolan, I suggest giving this one a shot. According to Netflix this movie will stop streaming on 11/20/13. Of course, sometimes they lie. Why is it in your queue? Christopher Nolan has made some interesting movies so I thought it'd be work checking out his early stuff. Is it artsy? It's an indie and it's in black and white, so yes. Not overly artsy though, more a having no budget kind of artsy. What stood out the most to you? How much an interesting story can cover up poor production values. What mood should I be in to watch this movie? Just don't have a fear of being watched and you'll be fine.